Six years of war brought many changes to familiar festive rituals. Christmas celebrations during the Second World War often had to be scaled down or adjusted as restrictions and shortages took their toll. For many families, the most difficult part of a wartime Christmas would be spending the festive season apart from loved ones. Many men were fighting abroad in the armed forces or were being held as prisoners of war. Women might also be away in the services or carrying out war work. Many children spent Christmas away from home as evacuees. By the end of the war, thousands of families had suffered the death of a family member either in action or from enemy bombing raids. Christmas luxuries were especially hard to come by at a time when even basic foods were scarce. People were forced to find substitutes for key festive ingredients. Gifts were often homemade and practical, and children’s toys were often made from recycled materials. Cards were smaller and printed on flimsy paper. In 1941, to conserve paper, the Ministry of Supply decreed that 'no retailer shall provide any paper for the packing or wrapping of goods excepting food stuffs or articles which the shopkeeper has agreed to deliver'. This made it difficult to keep Christmas presents a surprise. As in peacetime, singing songs and carols were rituals of wartime Christmases, along with the performance of pantomimes and festive plays. The BBC also broadcast a special Christmas Day radio programme. From 1939 onwards this featured a Christmas speech by King George VI, and became so popular with listeners that it became an annual ritual. A Shelter in Camden Town under a Brewery: Christmas Eve, 1940, by Olga Lehmann. Christmas 1940 took place in the middle of the Blitz. Between September and November London had been bombed for 57 consecutive nights. The bombing campaign showed no signs of abating as Christmas Day approached, so many people spent Christmas Eve in an air-raid shelter. The toys and gifts in this Christmas stocking from 1940 have been made from low-quality wartime paper. Post Christmas Letters By 20th December, 1941. This poster, designed for the General Post Office by George Him and Jan Le Witt, gives notice of the last posting date before Christmas. In wartime, finding adequate numbers of postal workers to deal with the influx of extra letters and parcels at Christmas time became more of a problem as many permanent staff members were in the armed services. There was also less space available to carry mail on the railways, which were needed for transport of troops and munitions. 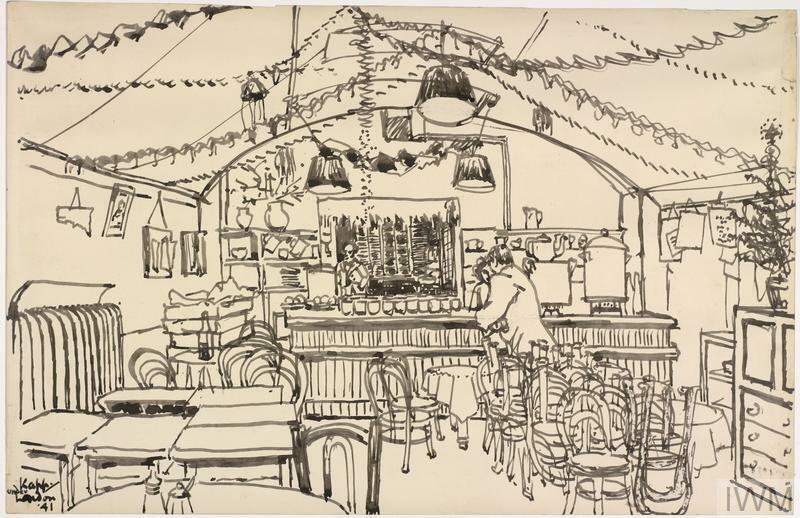 Ready for Christmas: the Canteen under St. Martin's-in-the-Fields, 1941, by Edmund Knapp. 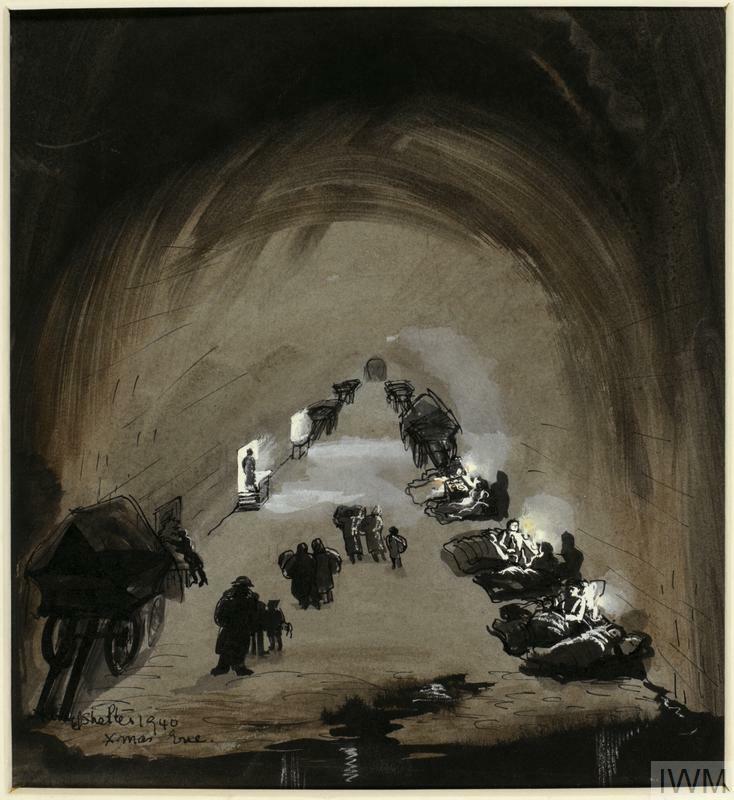 This drawing shows the interior of an underground canteen under St Martin-in-the-Fields church in London. Canteens like this provided shelter and refreshments for those who had been bombed out of their own homes, or who were working as fire-watchers or on other Air Raid Precautions (ARP) duties. In this photograph, an American serviceman (GI) and a member of the Women's Army Corps (WAC) are at a Red Cross Club in Britain. Many GIs who were away from home on Christmas welcomed the chance to spend the day with British families. The Americans often brought lavish gifts of food to their hosts, which were gratefully received. 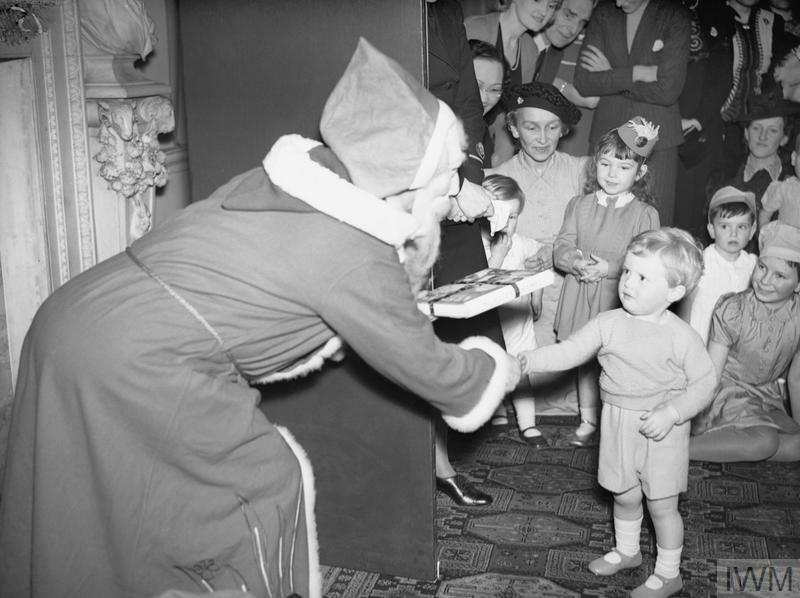 'Father Christmas' presents Prime Minister Winston Churchill’s grandson, also called Winston, with a book of nursery rhymes at a Christmas party for Allied naval officers' children held at Admiralty House in December 1942. This poster was issued by the National Savings Committee, which encouraged saving, discouraged frivolous spending and promoted public investment in the British war effort. 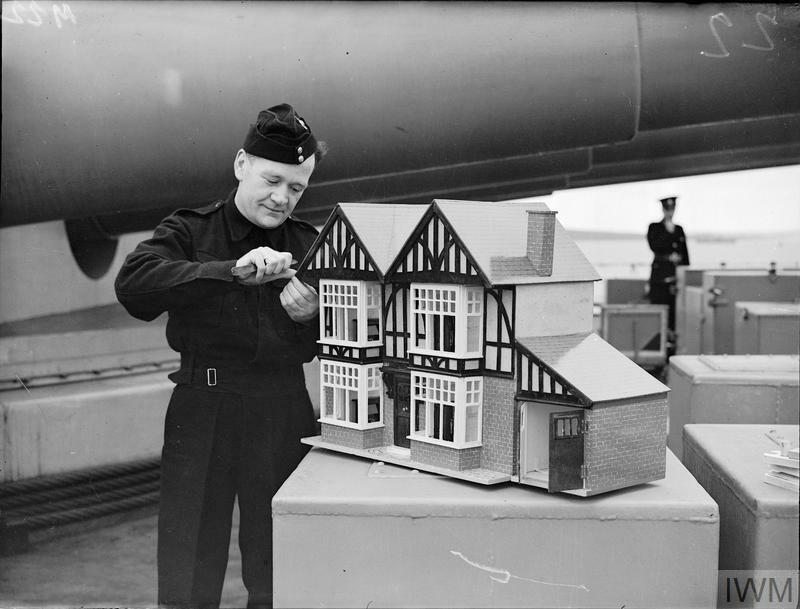 This photograph shows Royal Marine J Lynch on a battleship putting the finishing touches on a large doll’s house, complete with furniture, in 1943. In the weeks before Christmas, men and officers in the Royal Navy often put their practical skills to use by making presents for their families back home. 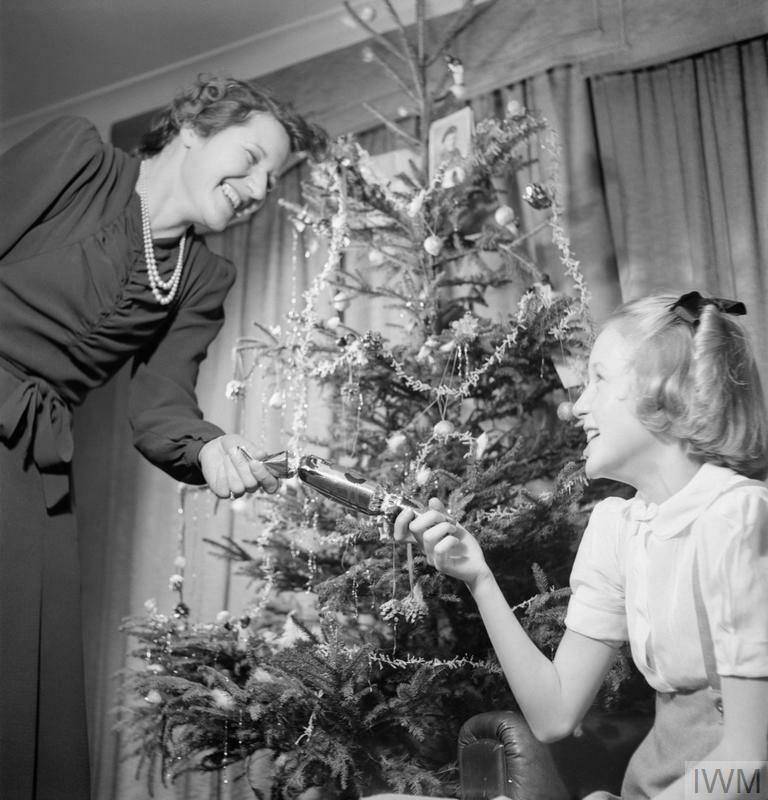 Mrs Devereux and her daughter Jean pull a Christmas cracker in front of their Christmas tree in 1944. This photograph is one in a sequence illustrating a YMCA scheme for delivering birthday and Christmas gifts to relatives of troops serving overseas. The tree in the photograph was bought under the scheme by Trooper Devereux while serving in Italy. His photograph can be seen on the tree. 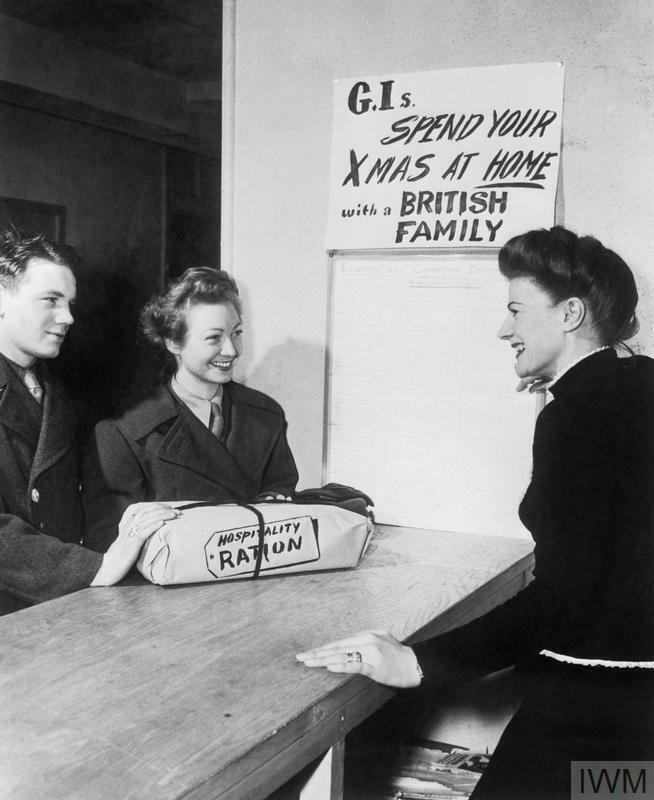 According to the original Ministry of Information caption, by 1944 around 20,000 gifts a year were being sent at a cost of about £35,000. Handmade toy seed drill made as a Christmas gift. This seed drill is one of a set of farm tools made during the Second World War by an 11-year-old boy for his sister, who had left home to join the Women's Land Army. They were all handmade from recycled materials. 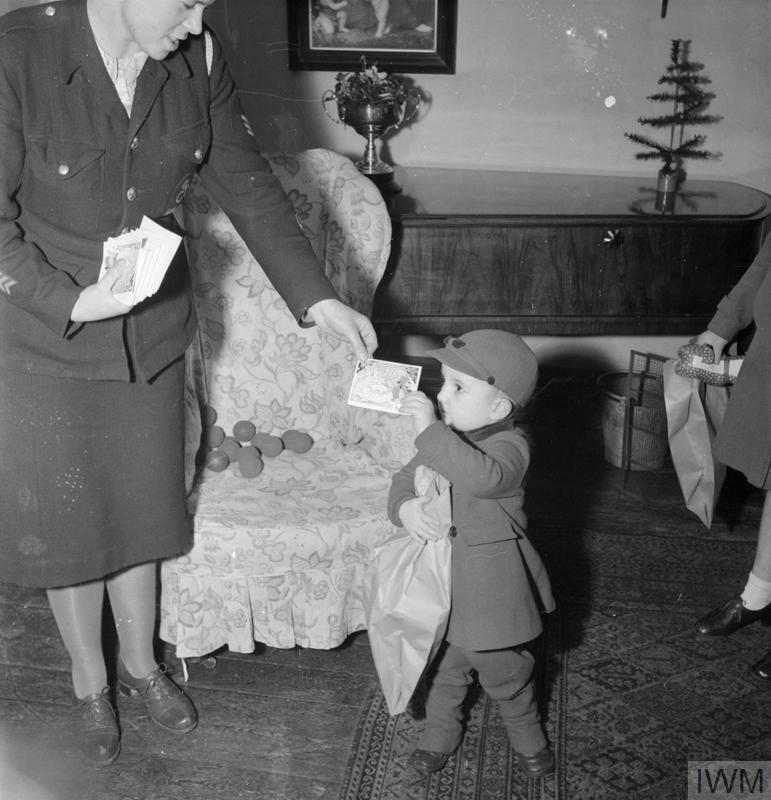 Derek Cunningham receives a Christmas card, savings stamp and gifts donated through the British War Relief Society (BWRS) in 1944. The BWRS was an umbrella organisation for many small charities that had sprung up across the United States to provide the British with clothes, food and other types of non-military aid. The BWRS acted as an administrative office and a central receiving depot for money and supplies, which were then distributed to organisations in the US and Britain. This photograph was taken in Canning Town in East London, which had suffered heavily in the Blitz. 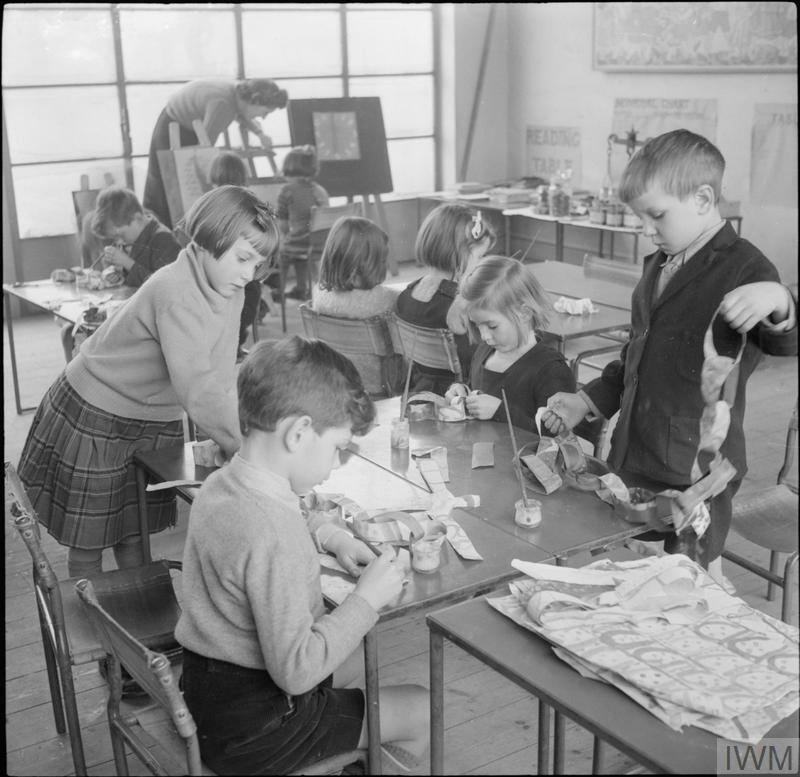 Pupils at Fen Ditton Junior School in Cambridgeshire make Christmas decorations in 1944. The children in this photograph are creating paper chains, a popular Christmas decoration. In wartime, these would be made from scraps of old paper or painted newspapers. Very few decorations were available to buy in the shops. 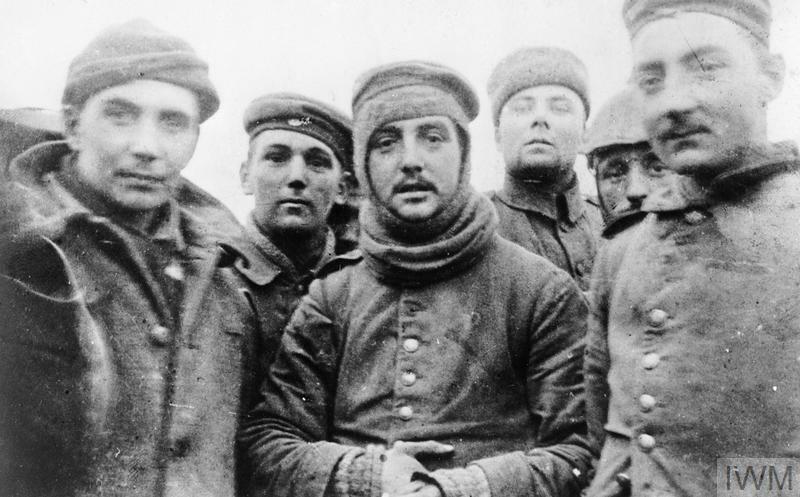 The Christmas Truce has become one of the most famous and mythologised events of the First World War. But what was the real story behind the truce? Why did it happen and did British and German soldiers really play football in no-man's land?